R.D. Hubbard paid $257,000 for Saturday's sale-topper Jess Helene, a Mr Jess Perry colt out of Rainbow Futurity(G1) runner-up Belle Helene. RUIDOSO DOWNS, NM—SEPTEMBER 1, 2018—Across the board increases continued in gross, average and median on the second night of the Ruidoso Select Yearling Sale at Ruidoso Downs Saturday. A $257,000 Mr Jess Perry colt was the second session sale topper. Preliminary gross numbers increased 8% to $9,254,000 on 211 head sold through two sessions compared to 206 horses in 2016 for $8,603,500. The yearling average rose 5% through two sessions to $43,858 compared to $41,765 the same night last year. The median is up 4% at $28,000 compared to $27,000 in 2017. Longtime Quarter Horse owner R.D. Hubbard, who sold Ruidoso Downs last year, paid $257,000 for the second session sale topper, Hip 210 Jess Helene. 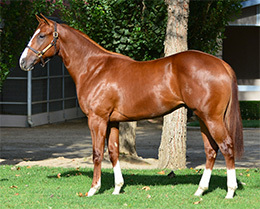 Lazy E Ranch, LLC, Agent consigned the son of leading sire Mr Jess Perry from the Rainbow Futurity(G1) runner-up Belle Helene by Valiant Hero. Jess Helene is a half-brother to stakes-placed 2-year-old Maghelene. Jess Helene's second dam is the Rainbow Futurity(G1) winner Thewayouwantmetoo, dam of four black type including champion 2-year-old colt A Revenant. Walt Knorpp paid $210,000 for Saturday's #2 sale-topper, Hip 216 This Is Us, a half-brother to four black type including champion 2-year-old colt and leading sire Foose. Lazy E Ranch, LLC, Agent consigned the Good Reason SA colt out of grade 2 winner Summertime Quickie by Royal Quick Dash. 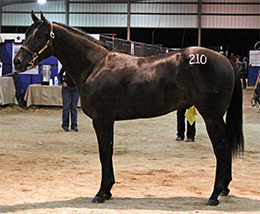 Lazy E Ranch, LLC, Agent, for Bob and Jerry Gaston also sold Saturday's third high-seller, Hip 184 The Night King. 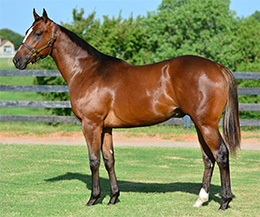 JGA Racing Stables Inc. paid $155,000 for the Pyc Paint Your Wagon colt from the unraced Fredricksburg mare Rustys Lil Lady, dam of three black type including Grade 1 Texas Classic Futurity winner Valiant Lil Lady and 2018 Rainbow Juvenile winner Rustys Miracle. Through two sessions R.D. Hubbard is the leading buyer with four purchases grossing $589,000. Don Cavenaugh has made three buys for $490,000 and Reliance Ranches LLC paid $417,000 for three yearlings. Lazy E Ranch, LLC, Agent, for McColee Land & Livestock, LLC is the leading consignor and/or agent through two sessions with nine yearlings totaling $1,050,000. Lazy E Ranch, LLC, Agent, was also the second leading consignor with 18 head for $980,500. MJ Farms, Agent sold 15 head for $656,500 and MJ Farms alone sold another 14 yearlings for $551,100 to be the third and fourth leading consignors. Mr Jess Perry is the leading sale sire (by average with two or more sold) through two sessions with 17 yearlings averaging $96,647. Apollitical Jess has 15 head for $63,933 average and Good Reason SA sold six yearlings for a $62,333 average. First sale-crop sire Kiss My Hocks has four yearlings sold for a $45,000 aveage. For preliminary results for Friday and Saturday's sessions, including hip-by-hip results CLICK HERE. The final session featuring hips 277 thru 416 will be offered on Sunday after the close of live racing at Ruidoso Downs. Preliminary sale results all three sessions will be available on StallioneSearch.com's SALE SECTION shortly after the close of each day's sale.